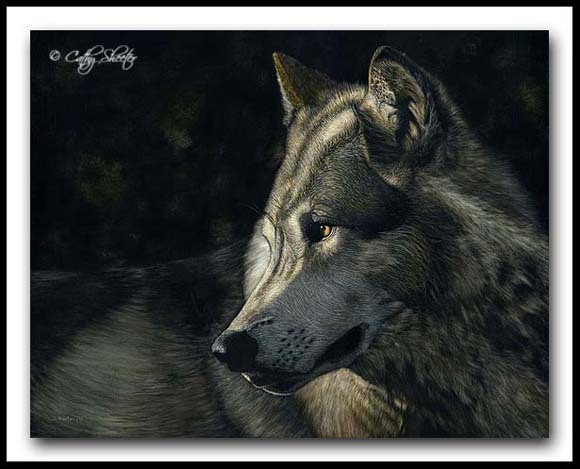 I met Colorado wildlife artist, Cathy Sheeter several years ago on WetCanvas! In one of the largest online art forums, Cathy stood out as a positive presence, working to pull together scratchboard artists and develop the medium as a recognized art all its own. Since the art world is so small, I wasn’t surprised to see Cathy again as an active presence in the Scratchboard Group on Facebook. Her work is not only stunning and original, but she is a constant guide and tutor, encouraging newbies to take on scratch work. Cathy began learning scratchboard in 9th grade on student grade materials. It was the linear expression and graphic look of the medium that drew her in. 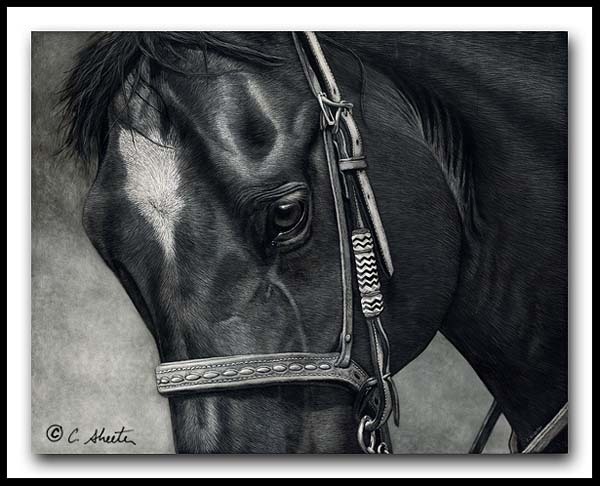 Scratchboard art can be very dramatic, like graphite, which is another favorite medium of Cathy’s. Since Cathy was already interested in drawing animals and their stories, scratch art made sense as it allows for tight details and dramatic lighting. 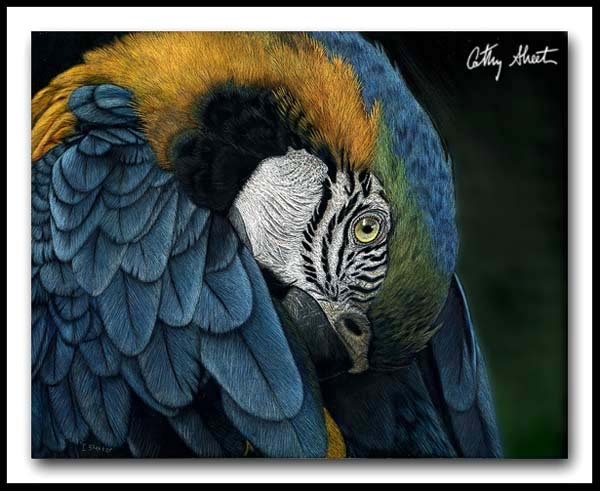 Besides Cathy’s extensive show schedule, she has found time to help establish the International Society of Scratchboard Artists, a society with annual juried exhibitions created primarily on Ampersand Scratchbord. Cathy was a founding member and also one of the first juried into Master Members of the society. Cathy also spends time online educating artists about Scratchbord. To find her online, you can view her artwork on her website, her writing on her blog and her helpful tips as Crias on the WetCanvas! Scratchbord Forum. You can also view Cathy’s work in person at several shows opening this year. April 27, her work is showing in Loveland, CO at the Colorado Governor’s Invitational Art Show running through May. She will also be showing in Tucson, AZ in May at the Settlers West Gallery Invitational Show. For more details, look at Cathy’s events link on her website. 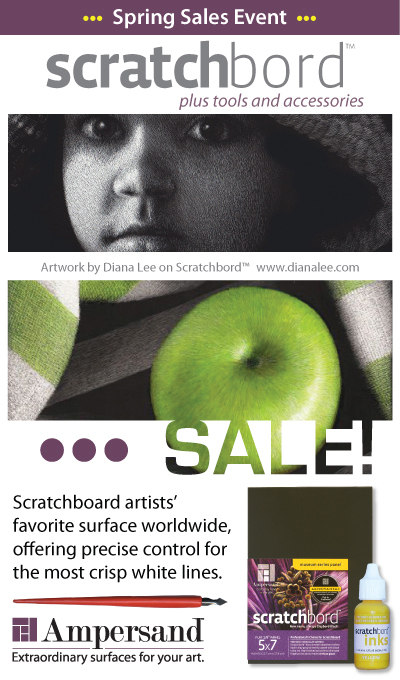 Right now, Scratchbord is on SALE!!! Along with Pastelbord and Aquabord and canvas texture Artist Panel, these boards can be found up to 60% off at local retailers.